What Can We Do to Get Rid of Puppy Mills? If you buy a puppy from a puppy mill (or a pet shop *PAWS EDIT*), you’re part of the problem instead of part of the solution, no matter how good your intentions are. Most, if not all, pet stores that sell puppies obtain these puppies from puppy mills. When you buy a puppy from a pet store, you increase the demand for these puppies and once again, you are part of the problem. Tell all your family and friends not to shop for puppies in pet stores or at puppy mills. 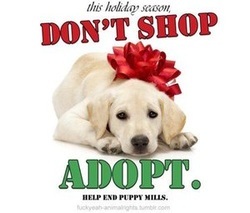 Is There Something You Can Do to Help Stop Puppy Mills? There are several things that you can do to help put an end to puppy mills and the cruelty, neglect and abuse that the animals housed there are forced to endure. If you are considering purchasing or adopting a new puppy or an adult dog, consider adopting from a shelter or rescue. If you have your heart set on a purebred puppy, purchase from a reputable breeder. Or better yet, consider adopting from a breed rescue. There are breed rescues for all breeds of dogs. Contact your local legislators by writing or calling and telling them you demand better laws for suffering puppy mill breeding dogs. Support legislation that regulates what type of housing and care must be delivered in puppy mills and kennels. Support legislation that bans the sale of live puppies in pet shops. Pet shop owners would have you believe that these laws are part of governmental attempt to legislate small business and argue that this type of legislation oversteps the role government should play in business. Perhaps that’s true in part. However, there is much more at stake here than just a businessman’s ability to run his business. The price that must be paid in animal lives is far too high to allow this particular business decision to persist. How many animals is it okay to sacrifice is the name of free enterprise? Consider fostering or adopting a dog rescued from a puppy mill. Many of these dogs have never seen the light of day, have had inadequate care and are in tough shape. These rescued dogs need safe homes with patient owners. Take the pledge to not buy anything from a pet store that sells puppies. Most pet shop puppies come from puppy mills. Giving your business to stores that sell puppies supports the horrible puppy mill industry. If a store sells puppies, don't buy anything there! Buy all your pet supplies from pet stores that don't sell puppies, or buy your supplies online. Don’t buy a puppy in a pet store or online—in fact, do not buy a puppy from any place that does not allow you to see its entire facility and meet the mother dogs. This includes websites that sell pets online. Anyone can put up a great-looking website boasting the highest standards of breeding and care, but you really have no way of knowing if such businesses are what they claim to be besides seeing them for yourself. Truly responsible breeders want to meet you before selling you one of their prized pups to be sure that he or she is going to a good home.